Deputy Minister in the Presidency, responsible for Planning Monitoring and Evaluation, Youth Development and Administration, Buti Manamela will give a keynote address at a dialogue on student movements. June 2016 marks the 40th anniversary of the June 16 youth uprisings of 1976. The 40th anniversary finds itself in the current context of the Fees Must Fall movement, preceded by the Rhodes Must Fall Movement. 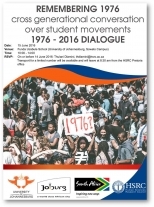 This cross generational conversation therefore seeks to draw parallels in student movements of 1976 to 2016 with a view to learn from the different eras of the movements. Under the theme “Remembering 1976” the cross-generational conversation will take place with some of the participants of the student protests in 1976 as well as the participants of the fees must fall campaign. The dialogue is also a platform where the challenges of students will be discussed and debated in order to provide hope for future generations. Deputy Minister Manamela is expected to pose a challenge to young people to find heroes within themselves and as they possess the leadership qualities to empower themselves.